I’ve updated our photo gallery with 19 portraits of Anya with “The Witch” cast for 2015 Sundance Film Festival. Make sure you check them out by clicking the thumbnails below. Enjoy! 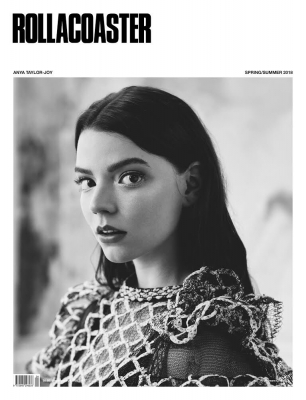 Saying in a pistachio-green embroidered Dior gown, her hair sprayed egg-yolk yellow, and her dark eyes flashing, the actress Anya Taylor-Joy brings to mind a punk version of Hamlet’s Ophelia—just before her tragic watery end. “Bella! Divina!” cheers the photographer Paolo Roversi, as Taylor-Joy’s ethereal image appears on the digital screen. The gown, from Maria Grazia Chiuri’s debut couture collection for the French house, is one of many that the 20-year-old will don over the course of the next few hours, slipping effortlessly in and out of them, much the way she does the characters she embodies. Taylor-Joy’s otherworldliness is especially beguiling onscreen. In 2015’s The Witch, she played a tormented teenager in 17th-century New England whose family is torn apart after one of her brothers disappears. She followed that up with Morgan, appearing as a mesmerizingly violent cyborg struggling to come to terms with her human side. And in Split, M. Night Shyamalan’s disturbing thriller about a girl abducted by a man with multiple personalities, Taylor-Joy conveyed with simmering intensity not just the terror of being held captive but also the strength of mind needed to escape. One easily senses how deeply Taylor-Joy is able to delve into the psyches of the emotionally complex women she has taken on in her short career. “She’s pure and open internally, and that’s why she’s riveting,” says Shyamalan. “The thing she wants to do more than anything is protect her characters. Filming Split, I would say, ‘You have to defend Casey more,’ and she would tear up.” Taylor-Joy describes herself as “very porous” to the personalities of other people, both real and fictional, and recalls how, as a child, she was just as happy hanging out with her real friends as with imaginary ones. “I would go off into the woods and play out seven different characters. I think I was purging emotions, and by putting them into a story, I felt lighter. I do feel things so intensely.” Off camera, though, Taylor-Joy is upbeat and effervescent; she can go from a posh English accent to Eliza Doolittle cockney to a Valley girl drawl in seconds. Indeed, she was hanging out in Central London when Sarah Doukas (who discovered, among others, Kate Moss) spotted her and promptly signed her to her modeling agency, Storm. Taylor-Joy dropped out of school at age 16 and, while on a photo shoot, met the Irish actor Allen Leech (aka Tom Branson, the chauffeur on Downton Abbey); after hearing her deliver an impromptu reading from the Seamus Heaney book she was carrying, Leech introduced her to his agent. Within four years, she was nominated for a BAFTA Rising Star Award, the British equivalent of the Oscars, and named Breakthrough Actor at the Gotham Independent Film Awards. I’ve updated the photo gallery with 5 portraits of Anya for 26th Annual Gotham Independent Film Awards. Make sure you check them out clicking the thumbnails below. Enjoy!